This certainly is armchair upholstery with the ‘wow’ factor. Our client chose a fabulous print from Warwick Fabrics that took this vintage chair from dated to bang up to date. The timber elements of the chair were restored too, adding to the unique style of the chair. This armchair had some age to it and now with new top quality fabric and restored timber elements, it looks so fresh and modern. A furniture piece the owners will enjoy for many, many years. 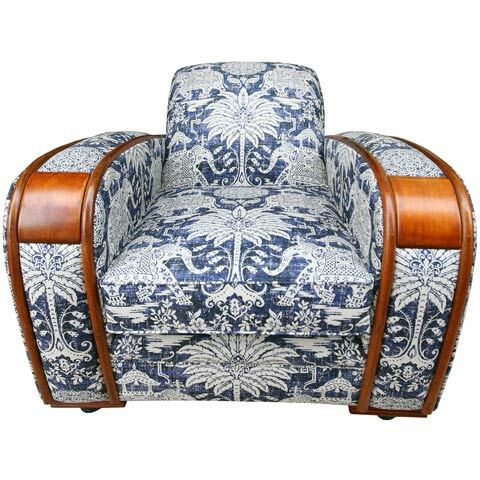 If you have a vintage armchair and not sure what to do with it, we can guide you through fabric suggestions to see the possibilities of what your tired looking armchair could like look. Please contact us via the website or call Rod Mandall on 3325 4714 for an obligation free quote.